Valentine’s Day 2019 marks one year since the mass shooting at Marjory Stoneman Douglas High School, the deadliest high school shooting in our country’s history. Maya Altman had just stepped out of her freshman biology class when she heard gunshots. That day, she would lose her friend, Alyssa Alhadeff. At StoryCorps, Maya sat down with her mom, Robyn, to remember. Top Photo: Maya Altman and her mother Robyn Altman at StoryCorps in Parkland, Florida. Photo by Madison Mullen for StoryCorps. 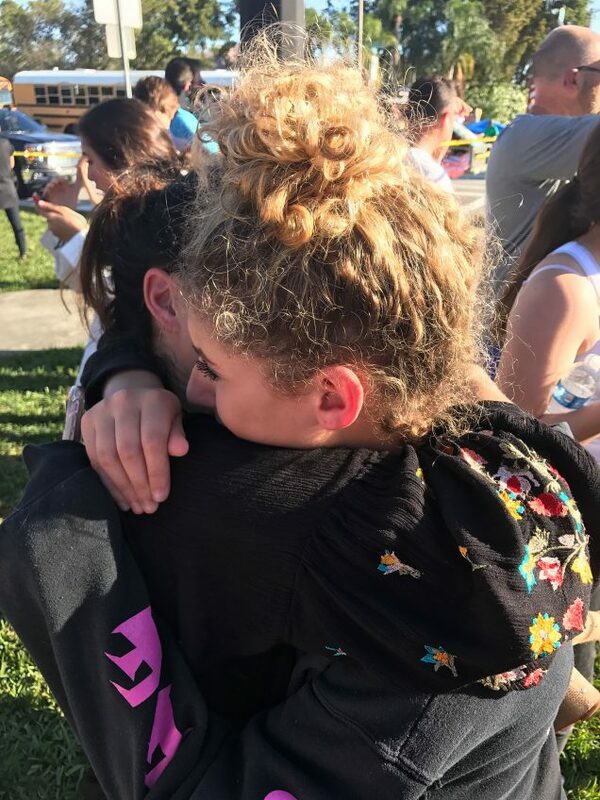 Middle Photo: Maya Altman and her mother Robyn Altman moments after Maya was evacuated from Marjory Stoneman Douglas High School on February 14, 2018. Photo by Adam Altman, Maya’s father. Originally aired February 8, 2019, on NPR’s Morning Edition. MA: I saw everybody running in every direction. And in the blink of an eye everyone was gone. I remember being thrown into the ROTC room. And I was told to go in the back, lay down, be quiet. RA: So you didn’t know yet? MA: I don’t think anybody really knew. I was on 10 percent, and dad was texting me, he said, ’What’s going on,?’ I said ’I don’t know.’ ’Do you see police?’ I said, ’No idea.’ And he said, ’Are you out of school?’ And then my phone died. And um, we were fighting that morning. I don’t remember why. I remember being like, my mom’s mad at me, and like, I’m never gonna say I’m sorry. After the SWAT came into my class, they had us run, with our heads down, and our hands on our heads. And um, they were like, ’Don’t look to your right, don’t look to your right,’ and obviously if somebody tells you not to do something and you’re a bunch of teenagers you’re gonna do it. And, the doors were open, and there were backpacks all inside, and it was red, and like everything was a mess. RA: When you say red, meaning, bl-, blood? RA: When I saw you, and I was able to touch, feel, hug you, I remember just like, not wanting to let go. What was your experience when you finally saw us? MA: I didn’t really think like, I’m so glad to see you. I just wanted to leave. And um, I remember we went home. And I was texting Alyssa, and I was like, where are you, are you ok? And Alyssa never texted back. So I was just praying. Please let her be ok. And um, she wasn’t. How did you feel about sending me back to Douglas? RA: I remember just feeling so uneasy. And you decided to go in by yourself and I remember thinking how brave you were. MA: I could talk to my creative writing teacher about things that I couldn’t talk to you about, because she understood everything. I mean, she got, she got shot. RA: Mm hm. How do you think the shooting affected your ideas for the future? MA: I don’t, I didn’t really think that there was a possibility that I wouldn’t grow up. You know? There was no possibility that, maybe I, I might die at 15. But like once I saw some of my friends did it was just like, I have a life. I want to, I want to do something. To feel worthy. RA: Seeing what you went through in this past year, and seeing how you’re sort of working through it, even on the toughest, toughest nights, I’m just so grateful, I’m just so grateful, and proud of you.